Bishop Terry called for politicians to use their influence to take positive steps to address the housing crisis as he launched an important new report at the Houses of Parliament. He said greater preference should be given to community-owned and led housing developments and to more should be done to tackle practices in public sector contracting that ignore the wishes of local people. 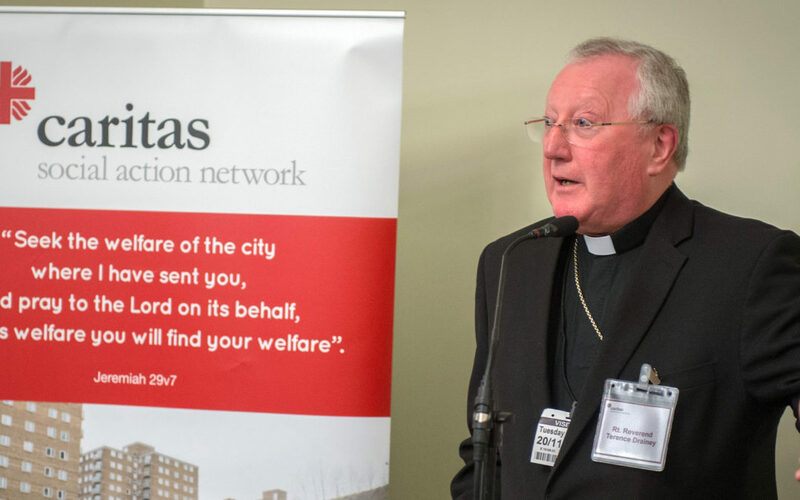 “Charities that have deep social connections in local neighbourhoods have been increasingly forced to compete for public funds, often for short-term payments with more strings attached, and against larger, remote organisations,” said Bishop Terry, speaking in his role as chair of Caritas Social Action Network (CSAN). The report – Abide With Me – is the result of a pioneering collaboration between Caritas Social Action Network and the ecumenical Centre for Theology and Community. It says co-ordinated action is needed on housing challenges in England and Wales at local, regional and national levels in the social mission of the Church from 2018-30. The 12-year timescale is aligned with international Catholic Church engagement on the UN Sustainable Development Goals. It reflects the need for a long-term approach to deep social and economic roots of the crisis. Abide With Me addresses the underlying causes of the crisis through fresh theological reflection and in conversation with people living in different housing situations, charities and experts in various fields. Among the causes of the current crisis highlighted are the common treatment of housing and land as financial assets and the strong link between modern housing development and increased social isolation. The report emphasises the need for the government and all citizens to address the concentration of the power for change in the state and markets. A more sustainable approach would favour more authentic community participation in decisions that affect the shape of the places we live in. The launch took place at CSAN’s annual parliamentary reception, which was attended by MPs, peers and representatives from many organisations that are part of CSAN. CSAN is an umbrella group of Catholic organisations that work for social justice within England and Wales, helping poor, vulnerable and marginalised people. See Bishop Terry’s column on the right for more information about the report and his visit to parliament. Each month throughout the year we’ll be focusing on a different aspect of the work of the many organisations that make up Caritas.